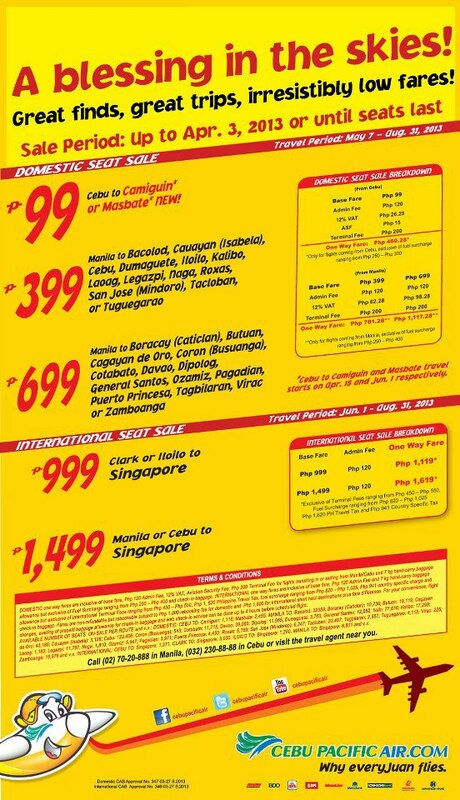 Dubbed as A BLESSING IN THE SKIES, Cebu Pacific is offering this super low flight fares. With domestic flights starting from P99, who wouldn't be captivated? So what do you think fellow travelers? Take note of the BOOKING date as well as the TRAVELING PERIOD. If you are from CEBU, you might be just lucky! Get the base fare for P99! But if you are flying from MANILA to different regions, base fare could start at P399 to P699. Check out some international destinations too! Going to SINGAPORE? Not a problem with Cebu Pacific! Take advantage of the promo! how about cotabato to manila fare?